Beijing: A seven-year-old giant panda has given birth to a cub through natural mating at a breeding centre in China for the endangered species, becoming the first to be born this way in the country this year. The giant panda gave birth to a cub yesterday at China Conservation and Research Centre for Giant Pandas (CCRCGP). Keepers do not know which male fathered the cub, or the gender of the new addition. This is the mother's, Shuqin, first cub. She showed strong maternal and nursing instincts, by immediately cuddling the cub and hiding it from keepers after her delivery. The keepers could only judge that the cub was healthy as they heard it crying, state-run Xinhua news agency reported. This is the first panda cub born as a result of natural mating in the centre this year. Luo Bo, deputy director of the centre, said Shuqin mated with two male pandas — Jinke and Xiangge — in March. 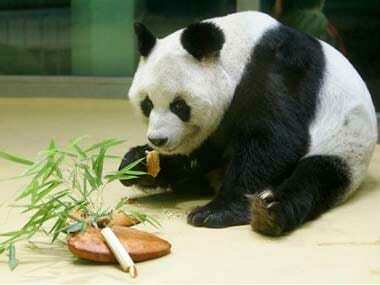 On June 19, their was a noticeable change to her appetite, a sign of pregnancy on pandas. Keepers have monitored Shuqin since 13 July. Most giant pandas in captivity are not good breeders. China has developed supportive breeding techniques to sustain the critically endangered species. However, only 24 per cent of females in captivity give birth, posing a serious threat to the survival of the species. Panda cubs born through supported breeding are often born in twins or even sometimes triplets. It is currently panda reproduction season. Experts at the centre said they have gone to great lengths to take care of the mothers and their cubs. There are currently three other female pandas — Xidou, Cuicui and Meixi — showing signs of pregnancy in the centre. The centre says it lets the pandas attempt natural mating first, and if they are not successful, they try supported breeding. Sometimes when a panda gets pregnant, keepers don't know whether it is from natural or supported mating. A cub's bloodline is later ascertained through a DNA test. China aims to increase the population of giant pandas living in captivity to 500 by 2020 with the current number of the endangered animals living in santuaries is at 422 at the end of last year. A total of 1,864 giant pandas live in the wild in China. The country has 67 panda sanctuaries, covering 53.8 percent of their habitat and 66.8 percent of the wild population. In the last five years, four giant pandas were successfully reintroduced into the wild.